If you are an Android power user – you like to tweak, gain root access, install custom ROMs – and you use a Samsung device, one of the most tedious tasks is to download official Samsung firmware, because all of the third party sources (like SamMobile.com and others) all have slow download speeds. SamFirm is a tool that takes care of that. The tool queries Samsung’s official servers, so there is no fear here of getting malicious code. It looks to be a simple tool, but as with all simple things, there is a learning curve that needs to be traversed. The inputs need to be quite exact so that the tool will have all the data it needs. Regardless of whether you wanted to gain administrator privileges, run special applications, run custom ROMs or free internal storage on your mobile phone, you had your reason to root your Samsung Galaxy smartphone. Then again, if you have started to notice that your gadget's functionality is starting to deteriorate and you know many jailbreak cases that just messed up the devices, then chances are that you are starting to doubt your decision. In the eventuality that you want to revert the changes made during the root, then you should not fret as there are some solutions available. 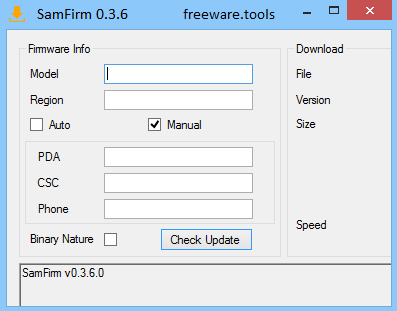 SamFirm is a light piece of software that enables you to restore Samsung devices to the default settings before the jailbreak. The idea behind the application is straightforward, as all you need to do is specify a few details about your firmware model and region so you can download the latest clean file. According to the developer, the tool is configured to download the desired firmware files directly from Samsung servers with no restriction whatsoever. However, there can be geographic location restrictions that you should account for. In case the automatic method does not provide you with the desired results, then you can switch to manual search. You can rest assured that the mode is not as complicated as it seems and it simply entails that you can add more details, such as CSC, PDA and phone information. If you do not know the basic data about your device, then you can try to retrieve the data using a specialized application.